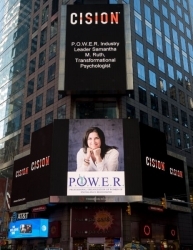 Denver, CO, March 08, 2019 --(PR.com)-- Samantha M. Ruth, Transformational Psychologist of Denver, Colorado has been showcased on the famous Reuters Billboard in Times Square in New York City by P.O.W.E.R. (Professional Organization of Women of Excellence Recognized) for her outstanding contributions and achievements for over 20 years in the fields of life coaching and visual psychotherapy. Times Square is one of the world’s most visited tourist attractions, drawing an estimated 50 million visitors annually. It is the hub of the Broadway Theater District and the world’s entertainment industry. Samantha Ruth is a Transformational Psychologist, author, and speaker. She is the founder and president of Never Give Up which provides services nationwide. Ms. Ruth offers a highly personalized approach tailored to each of her client’s individual needs. As a transformational coach, she wants to help her clients reach their goals and live their best, most fulfilling lives. After obtaining a B.A. in Psychology from the University of Michigan in Ann Arbor, Samantha obtained a master’s degree in Psychology from the Center for Humanistic Studies in Detroit, Michigan. She has written several articles in her field. While living in Michigan, Samantha specialized in providing individual, family, and group counseling. She also provided trainings, speaking engagements and crisis management for schools and companies. She worked at The Common Ground Sanctuary, Livonia Counseling Center, Oakland Psychological Clinic, and Great Lakes Psychology Group. When Samantha moved to Denver, she learned how large of a need there is for digital services and this led her to create Never Give Up. Among Samantha’s key areas of expertise are overcoming trauma and adversity, living successfully with mental health, self-esteem and confidence building, setting and accomplishing goals, and living your best, most fulfilling life. She also specializes in services for children, adolescents and young adults ranging from bullying to loss and grief. You can work with Samantha individually, in one of her private groups, or you can invite her to speak to your school or group, up close and personal. Samantha will also be hosting live workshops and events in the near future. Her Foundation, Whole Lotta Love, The James Lincoln Ruth Foundation, honors her late husband and aims to change lives through love. Some clients may feel unsure about an online coaching relationship but there are many benefits to Samantha’s digital services. Samantha is able to help clients regardless of their location from the comfort of their home. There are no hassles of commuting for a face-to-face meeting. There is full confidentiality and she provides secure online safety. Clients can schedule meetings to fit within their schedules, regardless of location or time zone. Ms. Ruth can work with clients via email, telephone or video, whatever works best and provides the most comfort. Being extremely holistic, she provides several alternatives to medication, looking at natural solutions first such as nutrition.